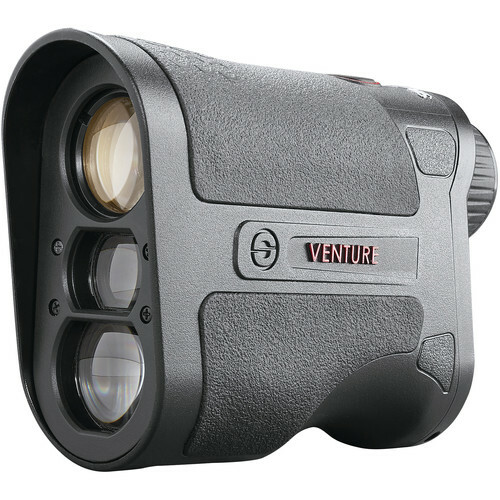 Combining an invisible infrared laser and inclinometer with a useful 6x20 monocular so you can make sure you are ranging to the right object, the Simmons 6x20 Venture Laser Rangefinder gives you the tool you need to take that shot or drive to the green with confidence—even when the terrain is rough. Running on a single included CR2 battery, it has a maximum range of 625 yards to a reflective target like the prisms on top of some golf flags or 480 yards to trees and large animals such as deer, with an accuracy of ±0.5 yards. This version of the Venture has an integrated inclinometer, which measures the upward or downward angle between you and your target, then—using their proprietary TILT system—calculates and displays an adjusted distance to improve your shot or drive accuracy. With simple and intuitive functionality, clear high-contrast in-view display, and an ergonomic form factor, the Venture will be your go-to tool in the field or on the links. Box Dimensions (LxWxH) 15.5 x 6.0 x 1.9"